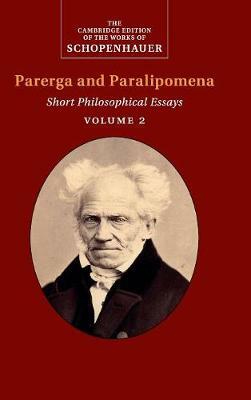 With the publication of Parerga and Paralipomena in 1851, there finally came some measure of the fame that Schopenhauer thought was his due. Described by Schopenhauer himself as 'incomparably more popular than everything up till now', Parerga is a miscellany of essays addressing themes that complement his work The World as Will and Representation, along with more divergent, speculative pieces. It includes essays on method, logic, the intellect, Kant, pantheism, natural science, religion, education, and language. The present volume offers a new translation, a substantial introduction explaining the context of the essays, and extensive editorial notes on the different published versions of the work. This readable and scholarly edition will be an essential reference for those studying Schopenhauer, the history of philosophy, and nineteenth-century German philosophy.